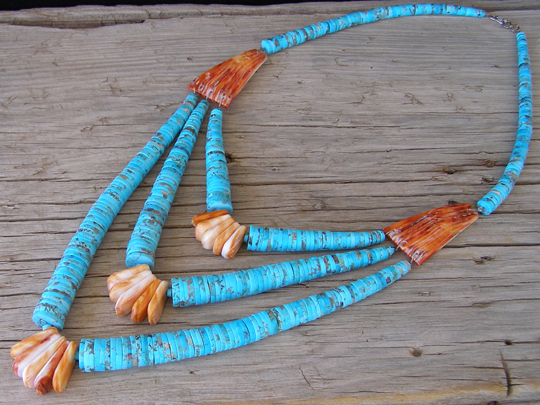 This spectacular necklace was made by Lupe Lovato from Santo Domingo Pueblo. Lupe makes all his disk beads by hand and, though some modern machinery is involved in the process, these are hand-turned beads. The amazing thing about these beads is the near-perfect uniformity in the thickness (or running length) of the beads and the smooth graduation in bead diameter. This is the work of an expert who has toiled for years mastering his craft. This necklace comes millions of beads down the road in the pursuit of excellence. Chacodog.com has been offering Lupe Lovato's work since 2002. The beads are made of stabilized Kingman turquoise and mottled with host rock matrix. A single strand of beads on each side (6 1/2" in length) forms the top of this necklace above the rich orange striated spiny oyster shields. Below the shields, the necklace consists of three separate graduated strands of beads with spiny oyster tabs strung at the bottom of the loop in classic jocla fashion. The whole of this is strung on beadalon (nylon-sleeved braided stainless steel wire) for durability. Measuring around the inside strand yields a measurement of 25 inches, while the distance around the outside strand to the tip of the spiny oyster tabs is 36 inches. The single strand at the top of the necklace has a very gentle graduation to its beads, ranging from 3/16" at the catch to 3/8" at the top of the spiny oyster shields. The beads composing the bottom three strands have a much more dramatic graduation and range from a smallest diameter of 1/4 inch for all three strands (just below the spiny shield) to 5/8" diameter. The spiny oyster shields are perfectly cut and polished with smoothly polished edges. These large shields measure 1 1/4" across their horizontal base, 2 1/8" in height and 1/2" wide at the top. The spiny oyster tabs are graduated in size and range in length from 3/4" to 1 1/8". This is a splendid necklace and Lupe seldom makes these. Measurement around inside strand: 25"
Measurement around outside strand: 36"
Disk beads: diameter ranges from 3/16" to 5/8"; running length ranges from 1/16" to 1/8"